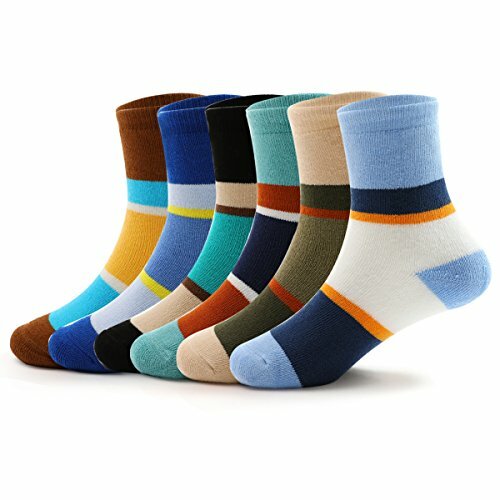 Characteristics: seamless, cotton, cute, comfortable, breathable, flexible, colorful socks; They are soft and sturdy, after washing soft, no fade, no deformation. - Sock size 4T-5T-6T fits shoe size 9.5 C US Little Boys - 12C US Little Boys. - We keep the color as much as possible in the picture, and occasionally there will be a color repeat or replace, but 6 pairs of kid socks are perfect match. - To wash your new crew socks, wash on gentle cycle in warm or cool water with mild soap, careful to avoid bleach or fabric softener. Tumble dry on low setting when finished. High quality boys seamless crew socks are made of 80% combed cotton, 15% nylon, 5% spandex. This warm winter socks is very soft, breathable, durable and will keep your feet comfortable and warm. 4 Sizes: 2T / 3T / 4T Toddler Boys Socks; 4T / 5T / 6T Little Boys Socks; 6T / 7T / 8T Boys Socks; 8T / 9T / 10T / 11T Big Boys Socks; Soft fabric and high elastic material for striped socks to provide the right size. Thick terry hosiery designed for children, it is suitable for winter; You also could choose for your Children, as birthdays, Christmas gift; The winter cotton athletic socks make them the perfect choice for hiking, cycling and all kids' outdoor activities. Hand-wash and Machine washable; Dry or low temperature drying your colorful socks. It is recommended to refer to the size of the shoe size; 6 pairs random colors cute thick athletic socks in one package. If you have any questions about this product by COCOLUNAM, contact us by completing and submitting the form below. If you are looking for a specif part number, please include it with your message.